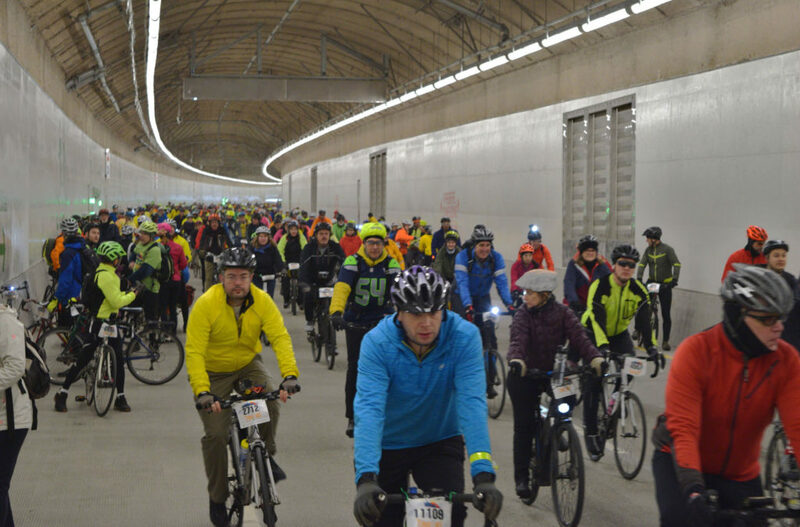 Twelve thousand cyclists pedaled through downtown Seattle on Sunday, Feb. 3, 2019 to commemorate the opening of the new SR 99 Tunnel under the city and the closing of the waterfront Viaduct, which is to be torn down now that the replacement tunnel is finished and ready to open. With a bit of chill and wind but no rain (or predicted snow), dressed-for-weather bicyclists pedaled first southbound through the top level of the new tunnel, then stayed on the SR 99 highway southbound to the West Seattle Bridge before making a U-turn and biking north into the northbound tunnel lanes, which are on the lower level of the two-tiered tunnel. Exiting the tunnel into the South Lake Union neighborhood, cyclists were routed quickly back into another tunnel–the old Battery Street Tunnel, which is slated to be filled with rubble from the Viaduct as it’s torn down. The narrower, dimmer old tunnel provided the gateway to the Viaduct. The old Battery Street Tunnel is narrow and dark and has no breakdown shoulder space. And the old tunnel is showing many signs of wear, like this crumbling concrete. A group of costumed cyclists with a boom box started an impromptu dance party on the Viaduct. 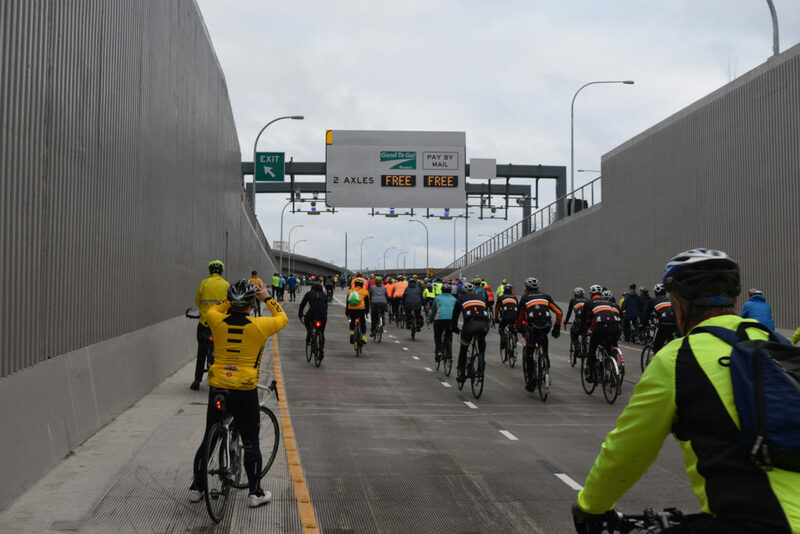 Regular drivers of the route would note that the bicycle tour went in reverse direction: southbound bicyclists used the northbound tunnel lanes and top level of the Viaduct. After looping around via the Seneca Street off-ramp, the tour continued northbound on the Viaduct’s lower level, which had been for southbound car traffic. The ride ended by coming out of the southbound lanes of the old tunnel and onto a surface-street finish line festival. The new corporate sponsors of the Mariners baseball stadium are named in the tunnel’s new signage. Connie and Susie at the south tunnel entrance. Cyclists pass Pike Place Market on the Viaduct. Access to Seattle’s best tourist attraction will be greatly enhanced when the old elevated highway is removed from the scene.